Champagne in bed? Yes please. 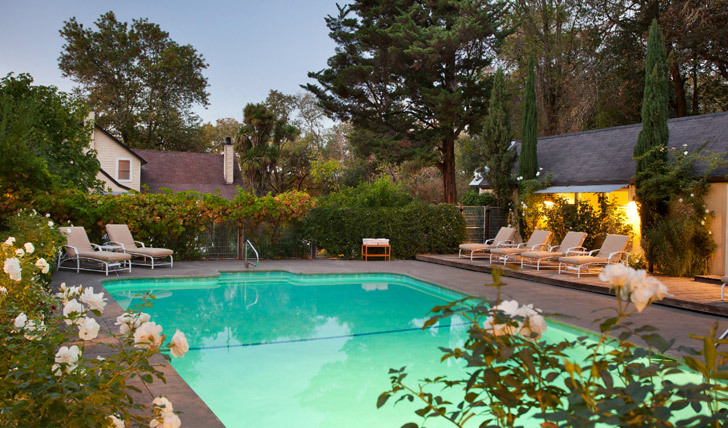 For a romantic idyll in the heart of California’s wine country, head to Farmhouse Inn. Originally a farmhouse, as the name would suggest, this beautiful rustic property has effortlessly evolved into a luxurious retreat in the heart of wine country. An easy drive from San Francisco or neighbouring Napa Valley and you’ll soon find yourself settling into the wilds of a beautiful, rural landscape. Farmhouse Inn is an utterly relaxing escape, but it’s also an easy jaunt into the gourmet towns of Healdsburg and Santa Rosa, as well as a plethora of Sonoma Valley wineries. Should you want to venture further afield, you can enjoy hikes amongst the Redwoods and along the rugged coast. Dotted around the gardens, you’ll have the option of staying in the original farmhouse, its outbuildings or a barn. A perfect fusion of chic and rustic, each room of the rooms oozes tranquillity with light flooding in from the windows. Soft colours, sumptuous bedding, quirky wooden furniture and a fireplace you can enjoy in your room and on your private terrace all add to the cosy feeling. Oh, and don’t get even get us started on the beds. Quite possibly some of the largest and comfiest we’ve ever seen. It’s the little touches that do it for us at Farmhouse Inn. Aside from being welcomed as though you’re family, with a glass of local wine, you’ll also find a ‘Farmhouse Provisions’ box in your room, fully loaded with local goodies. And if you’re still hungry after those, you’ll get freshly baked cookies and marshmallows by your bed each night. Our best bit? The s’mores bar. No doubt about it.